View of the newly protected Clermont Estates property.Robert Rodriguez, Jr. Located within the Hudson River National Historic Landmark District and the Estates District North Scenic Area of Statewide Significance, this property features a mix of open meadows and forested ridges. It includes over 2,000 feet of frontage on Woods Road, a scenic byway popular with tourists and bicyclists. 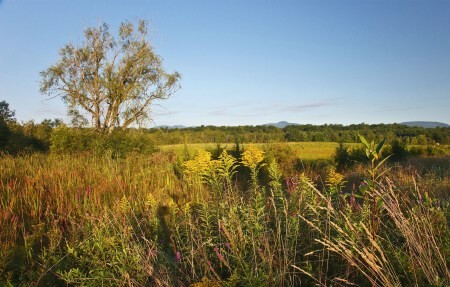 Thirty acres of grasslands provide prime bird habitat; a stream flowing through the land runs into the Hudson River. Our purchase of development rights guarantees that 90 acres of USDA Prime Soils or Soils of Statewide Significance can continue supporting Clermont's agriculture-based economy while contributing to its rural charm. Since we initiated plans to protect a "critical mass" of working farms in Clermont in 2004, we've conserved more than 650 acres encompassing five farms. Additional nearby land has been preserved by the Columbia Land Conservancy and Winnakee Land Trust. Including adjacent Clermont State Historic Site, these protected properties span nearly 1,200 contiguous acres, safeguarding local aquifers—a prime source of drinking water—and the interconnected network of habitats on which many wildlife species depend. The purchase is part of Scenic Hudson's collaborative campaign to Save the Land That Matters Most, protecting 65,000 acres of great scenic, ecological and agricultural significance.